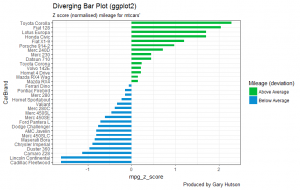 The aim here is to create a diverging bar chart that shows variance above and below an average line. In this example I will use Z Scores to calculate the variance, in terms of standard deviations, as a diverging bar. This example will use the mtcars stock dataset, as most of the data I deal with day-to-day is patient sensitive. As commented, this line uses the existing mtcars data frame and uses the dollar sign notation i.e. add a new column, or refer to a column, to create a column name called CarBrand. Then we assign the car brand (<-) with the rownames from the data frame. This is obviously predicated on there being some row names in the data frame, otherwise you would have to name the rows using rownames(). A Z score is a calculation which uses the x observation subtracts said observation from the mean and divides by the standard deviation. The link shows the mathematics behind this, for anyone who is interested. The statistics behind the calculation have already been explained, but I have also used the round() function to round the results down to 2 digits. The ifelse() block looks at whether the Z Score is below 0, if so tag as below average, otherwise show this as above. Now, I have everything I need to start to compute the plot. Great stuff, so let’s get plotting. Here, I pass in the mtcars data frame and set the aesthetics layer (aes) of the x axis to the brand of car (CarBrand). The y axis is the Z score I created for miles per gallon (mpg) and the label is also set to the z score. This indicates that I need to use the mpg_z_score field by forcing the stat=’identity’ option. If this was not added, then it would simply count the number of times the Car Brand appears as a frequency count (not what I want!). Then, I stipulate the fill type of the bar to be equal to whether the value deviates above and below 0 – remember we created a field in the data preparation stage to store whether this deviates below and above 0 and called it mpg_type. The last parameter is the width parameter to indicate the width of the bars. Here, I have added the labs layer on to the plot. This is a way to label your plots to show more meaningful values than would be included by default. So, within labs I use subtitle, title and caption to add labels to the chart. Finally, the important command is to add the coord_flip() command to the chart – without this you would have vertical bars instead of horizontal. I think this type of chart looks better horizontal, thus the reason for the inclusion of the command.